"Budget and location wise recommended with free coffee every..."
Have a question for Blessed Inn? "Perfect spot in my opinion"
"The place has a good location and in the heart of the town." "I highly recommend staying here during low versus high season or close town." "The guest inn is walking distance to many things, from the n..."
Whether you're a tourist or traveling on business, Blessed Inn is a great choice for accommodation when visiting Palawan. Set 0.5 km from the excitement of the city, this 1-star hotel commands an excellent location and provides access to the city's biggest attractions. For those of you who want to venture out, Parish of St. Francis of Assisi, Tres Marias Island, Corong Corong Beach are just some of the attractions available to visitors. Offering hotel guests superior services and a broad range of amenities, Blessed Inn is committed to ensuring that your stay is as comfortable as possible. The hotel offers access to a vast array of services, including free Wi-Fi in all rooms, Wi-Fi in public areas, tours. Step into one of 4 inviting rooms and escape the stresses of the day with a wide range of amenities such as mirror, towels, internet access – wireless, non smoking rooms, air conditioning which can be found in some rooms. Besides, the hotel's host of recreational offerings ensures you have plenty to do during your stay. Discover an engaging blend of professional service and a wide array of features at Blessed Inn. "Location is good, just a short walk to the restos, beach and..."
Budget-friendly, near the front beach and port, very friendly staff. Overall 5 Star for me. Not to good not to bad.. PROS Great location downtown el nido 5-10 min. walk to the beach/port. Great view though (rock view) They serve hot water with cofee in the morning. Aircon with fan with own CR/bathroom change the mattress and everything on our 4th day (requested) CONS does not have water dispenser hot/cold no lobby but they have 5-7 chair at their reception 4days stay 1st and second day disturb by someone calling/knocking for their el nido to puerto transport 1st day was really annoying knocks really hard and wakes us up 4am or 5am we were on the first room and his knocking on the wood directly to our room it was really loud. Not to much privacy the wall is made out of plywood. Not too much space. But i can suggest this place because its cheap compare to other place to stay there. Great and comfortable place to sleep except on that knocking in the morning. you should work on that. It’s very noisy. If you are a deep sleeper and don’t mind tricycle and scooter noises buzzing in your ear this is a place to stay. It’s located close to great restaurants and El Nido port. I highly recommend staying here during low versus high season or close town. The owner is very nice and cleaned our place after 3 days of stay. Aika and her father were such lovely hosts. 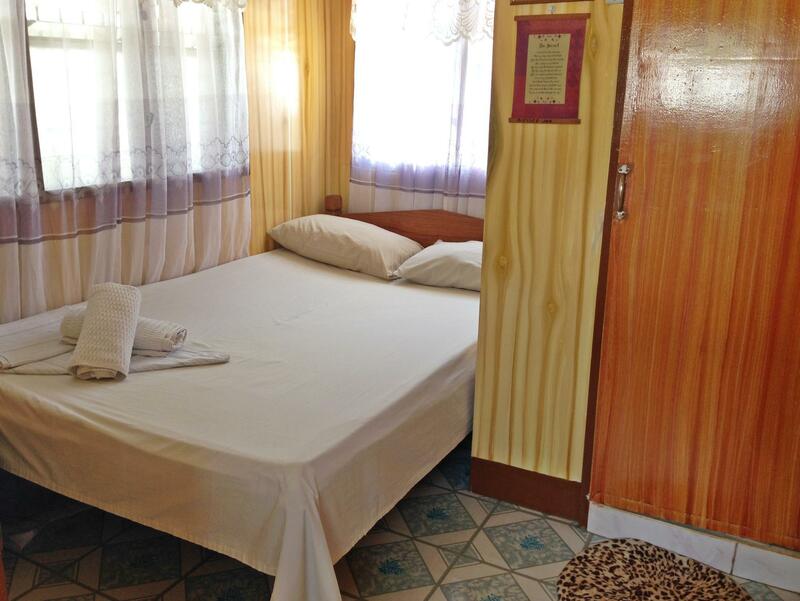 The room was basic but excellent value for money, right in the centre of El Nido. The wifi was brilliant, the best we have had while in the Philippines. The room can be noisy however with the sound of traffic but worth it for it's excellent location. We look forward to staying again. This was a great gem hostel in El Nido. It was clean and very centrally located, which is why you may hear a lot of tricycle noise specially if you are in room 3, however, the noise quiets down at night and you can learn to ignore it. For the price paid, this hostel is amazing specially because other hostels in El Nido are really expensive with the same quality (we stayed in another hostel during our time in city). If you want to do a tour package, I recommend you to go the tourist agency on the same street with black and white checked floor. Joanna was really friendly and honest with us. Midtown bakery was also very delicious and cheap. Try their pan de coco. The hostel owner offers hot water in the morning for coffee and tea. Thank you. The owner/receptionist was so friendly and accommodating. The room is so clean and the bedding and sheets smell good. Walking distance to the shore. The room is small and the bathroom also is so small. The price is cheap so don't expect much. No staff was here on our arrival but the hotel next door rang them and hey got here quickly. The room is small but big enough for us and our 2 big backpacks, bathroom is fine ( water is yellowish but that’s how it is in the city I guess), everything was very clean, one night out of three has been very noisy (loud music few blocks away) but the road noise didn’t bother us. Prices are low for accomodation in El Nido and we were not expecting our stay in this hostel to be that good! We had a great stay at blessed in. You get your own double bed & little shower/toilet room for super cheap! We had friends paying triple the price for a bunk bed - which is what you can expect in El Nido to be honest. So we were pleasantly surprised with what we had at blessed inn. Although, when we arrived we had a bit of a shock...we heard a rustling coming from the bin, opened it to find a mouse inside! We were as shocked as the landlady to be fair, so she quickly sorted it and after that we had no trouble. The rooms are pretty hot, even with the fan, and it is on the main road so expect noise from bikes/tricycles, but we were pleasantly surprised with our stay at blessed inn and would definitely recommend it to the budget traveller! The room was clean and the bed was comfy but very small for two people, especially as I’m 6’4 but it was alright really! Fan in the room kept us cool at night and the little balcony out the front is an added bonus. The road can be quite loud but quietens down at night. There is a little convenience shop just opposite which was useful. Lastly, the host was lovely and very helpful in booking tours etc and there is free coffee every morning outside the room. Would recommend! Room is very small, but has everything you need. Aircon and working wifi, drying line outside. Great location. One of the best price to find. The guest inn is walking distance to many things, from the night market and the alleyways in finding great food to the quick buys. It is actually easy to navigate around the small town of El Nido. The owner upgraded us into a 6-capacity bedroom, so we were really grateful (We are a group of 3 and we had double beds each!) Free coffee in morning and there's a small eatery just right in front of the guest inn (very convenient if you have an early tour). Ivy was helpful in all our needs, especially when we couldnt contact the tour company that we hired for all our tours (we already paid them half), so we appreciated her help. Everything was splendid!! The room was very much to our liking as a couple and as to the price we paid for it. But what we like the most was how accommodating the staff were!! Definitely staying here for our next return in El nido!! hotel was pretty average for the amount it cost (£16 a night) the main issue was the toilet didn't have a flush you had to use a buket and the road outside is very noisy all day and all night. The Wi-Fi however worked occasionally well. overall accommodation in El Nido is fantastic anyway but I think you defintely get some where better than here for £16.00 a night! Booked room for 2 persons. The bathroom is too small. I was unable to switch off or increase the temp of the aircon. Budget and location wise recommended with free coffee every morning. Pros - its a good place.the money was worth it. The staff is approachable. Cons - the toilet room is very small. There is no flush available. You have to manually flush.